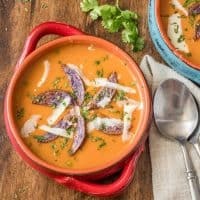 Is it too hot for soup in the northern hemisphere in summer? I admit reluctance to prepare and serve soup during the warmer months (year ’round in McAllen 😯 )… A month in Peru had me re-considering. Nearly every meal began with a soup – quinoa, corn, criollo, simple vegetables – to name a few. I looked forward to the soups at lunch and dinner each day. 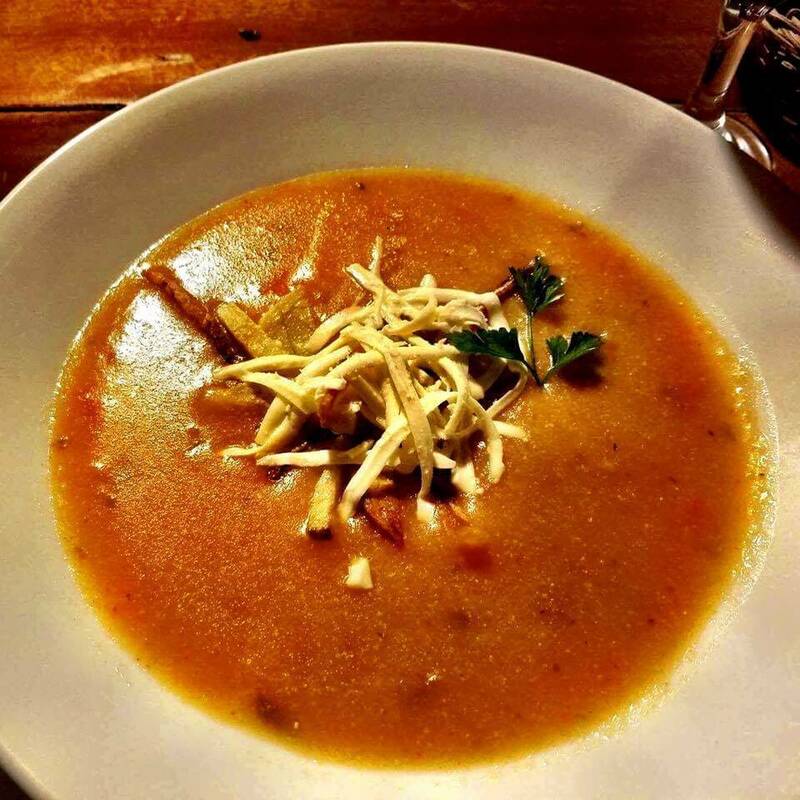 Must soup be reserved for chilly winter days? 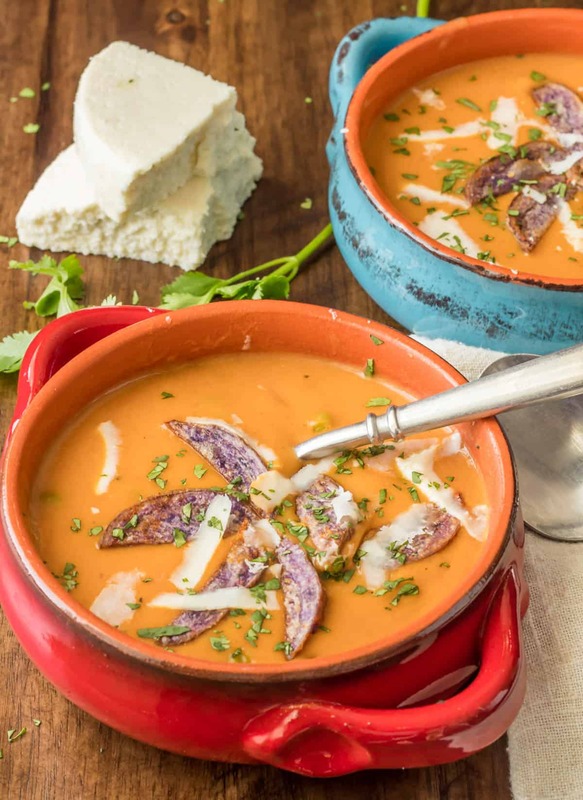 A simple creamy tomato soup was easily one of my favorite dishes of our entire trip! Of course we didn’t just eat in Mandor! We enjoyed an afternoon in Los Jardines de Mandor. Our group biologist (my husband Mark) did some “biologizing,” pointing out many unique species of plants and identifying some beautiful birds along the way. The falls at the end of the trail were lovely, and a few brave students actually dipped below the surface of the freezing cold water. The next morning, Mamá Angélica packed healthy box lunches, and we began our trek to Machu Picchu. The excitement was palpable. We hiked about 5 miles along the train tracks and the beautiful Urubamba River. After crossing the river near Aguas Caliente, we arrived at THE STEPS. At the time, they felt like the steps of death. 1500-2000 of them. Straight up. With nearly 100% humidity and temperatures in the sixties, we struggled to put one foot in front of the other for about 1 1/2 hours. It was somewhat comical to hear bus-riding tourists complain of the exertion once entering the park. Lol. Trekkers go on foot, not in an air-conditioned bus. 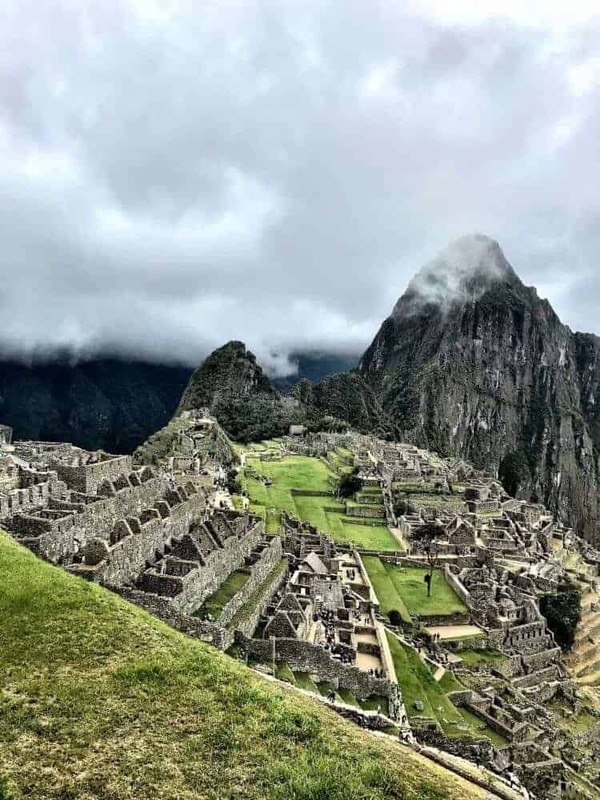 Machu Picchu has been in the #1 spot on my “bucket list” for at least a decade. Just ask my kids. The joy and elation felt at the first glimpse of the magnificent ruins is really indescribable. 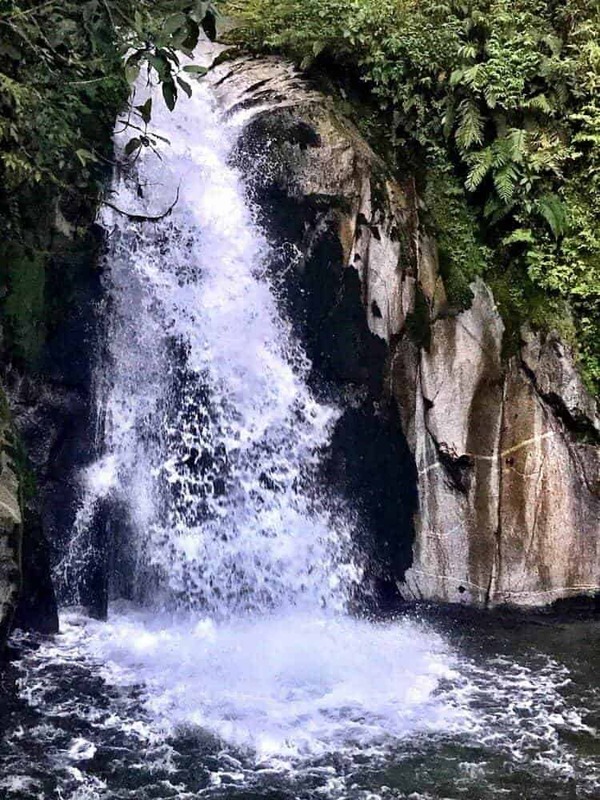 Though at times it felt like “Disneyland in the Andes,” it was a heady experience. Or was it the altitude and exhaustion? 😯 Joking aside… Machu Picchu has to be experienced. Photos do not do it justice. It truly is a magical place! The trip back down the mountain to the canyon floor and Agua Caliente of course went more quickly than the ascent. We were quite ready for a hot shower and a pisco sour when we arrived at Hotel Wiracocha Inn a couple of hours later! Wow. Just. Wow. One can only guess at methods and ingredients when re-creating a dish. Years experience with roasting vegetables has convinced me that it’s by far the best method for extracting flavor from vegetables. Boiling and steaming just don’t cut it. So, the extra step is critical in developing the rich flavor of this soup. What makes it Peruvian-style? I add a bit of Aji Amarillo Paste to the cooking liquid. Aji amarillo is a bright yellow, spicy chile that is a staple in Peruvian cooking. If you’re not familiar with the chile, you may wish to add half the specified amount, and taste before adding more. I’m a New Mexico girl, and I don’t find the aji amarillo to be terribly hot (not like the rocoto!). An immersion blender is an important kitchen tool if you like to purée soups. I cringe when I read soup recipes that suggest pouring boiling hot liquid into a blender! Please don’t! The “boat motor” (as we refer to ours) takes the mess and the risk of burns out of the process. After blending thoroughly, I prefer to pour the soup through a strainer. 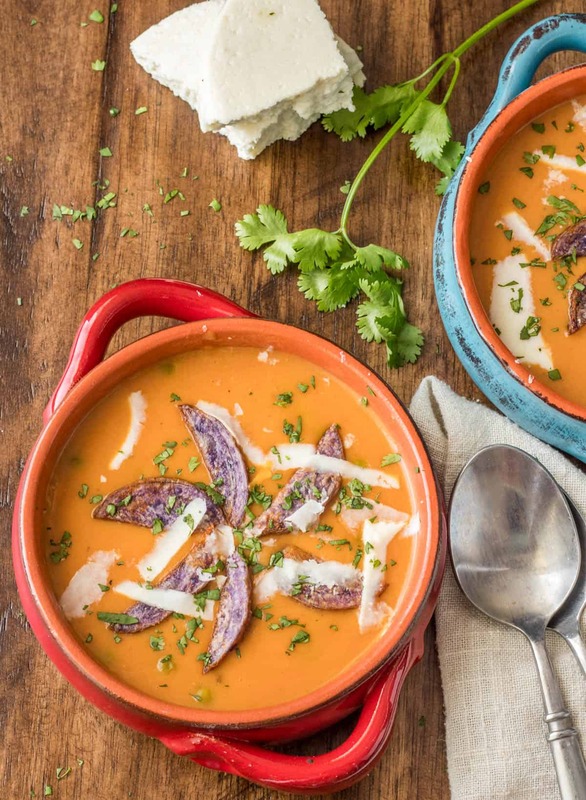 This results in an amazingly silky soup. You can omit this step if you prefer. 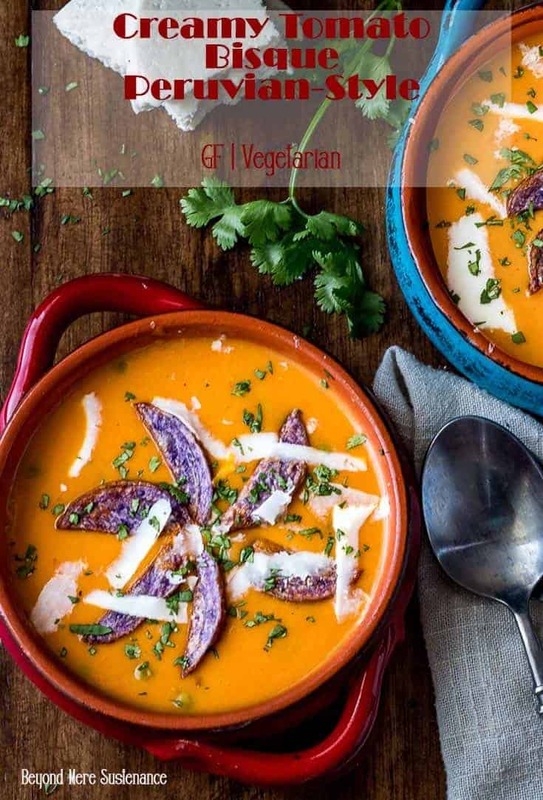 A fresh and creamy soup light enough to enjoy as a starter course even in summer... Creamy Tomato Bisque Peruvian-Style - at once familiar and exotic - will have you licking your bowl and asking for more! Preheat oven to 425 (400 convection roast). Arrange vegetables and garlic on a baking sheet. Drizzle with olive oil, and sprinkle with sea salt. Roast until edges begin to caramelize. They don't have to be completely cooked. Add caramelized vegetables to a dutch oven. Pop the roasted garlic cloves out of their skins, and add to the vegetables. Add the dry sherry and 3 cups broth/stock, and bring to a boil. Reduce heat to a simmer. Simmer 10-15 minutes while you prep the garnishes. Vegetables should be very tender. Using an immersion blender, puree until very smooth. I like to pour the puree through a strainer as it results in a very silky soup. This step is optional! Add the puree back to the pot over medium heat. Add the peas and half n half, and cook about 5 minutes until everything is hot. DO NOT BOIL. Ladle the soup into bowls. Garnish as desired. Enjoy! Use good quality broth/stock of your preference. Obviously, use vegetable stock if you want a vegetarian soup. I use both homemade and good commercially prepared stock in this recipe. Aji amarillo is often referred to as a "hot" chile, but I find it to be fairly mild with a sweet, earthy flavor. If you're uncertain, start with half, and add if desired. There really isn't a good substitute. Macronutrients are an approximation only. I entered Trader Joe's Coconut Creamer (not half n half) and did not include garnishes.